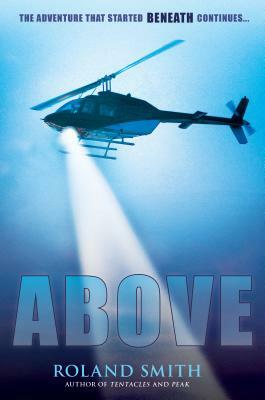 Pat O'Toole and his brother, Coop, are on the run from an enemy that specializes in hiding in plain sight. Along with their new companion, Kate, they've narrowly escaped a cultlike community situated beneath the streets of New York City. Kate has lived underground since birth, and the world above thrills her, but it's treacherous as well. With the cult's leader -- Kate’s grandfather -- hatching a new scheme of global consequence, the three runaways may be the only ones who can stop him. Will they face him head-on, or will they spend the rest of their lives as fugitives? The adventure that started Beneath concludes Above in this action-packed middle-grade thriller by Roland Smith! Roland Smith first worked with animals at the Oregon Zoo, and he has been involved in animal rescues and conservation work around the world for more than twenty years. He is the author of numerous books for young readers, including Jack's Run, Zach's Lie, Peak, the Cryptid Hunters series, and the Storm Runners series. He is also the co-author of numerous picture books with his wife, Marie. Roland lives with Marie on a farm south of Portland, Oregon. You can find him online at rolandsmith.com.